Every business needs to have a website these days. That applies to businesses that get most of their customers and do the work offline. 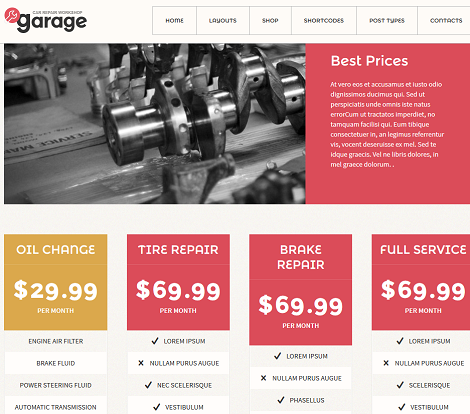 Garage happens to be a professional theme for car mechanics and car repair workshops. It has a responsive, retina ready design and supports one-page websites. Garage is also WooCommerce friendly. Garage comes integrated with Layer and Revolution slider plugins. It is coded in HTML5 and CSS3. There is also a visual drag & drop Content Composer with over 99 custom shortcodes. The theme lets you save your content parts as templates and reuse them on other pages. There are also various custom widgets, a custom form builder, Google fonts support, and content animation. 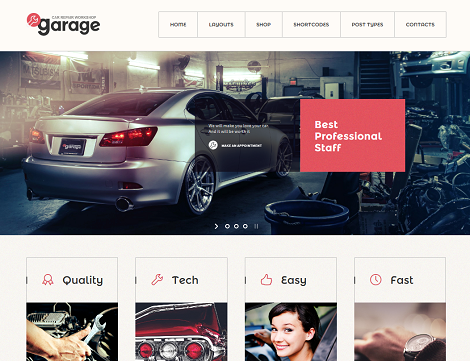 The Garage theme looks clean and easy to customize. It fared fairly well in our pagespeed tests but could be improved in this area. This is a premium theme by an Elite Author.